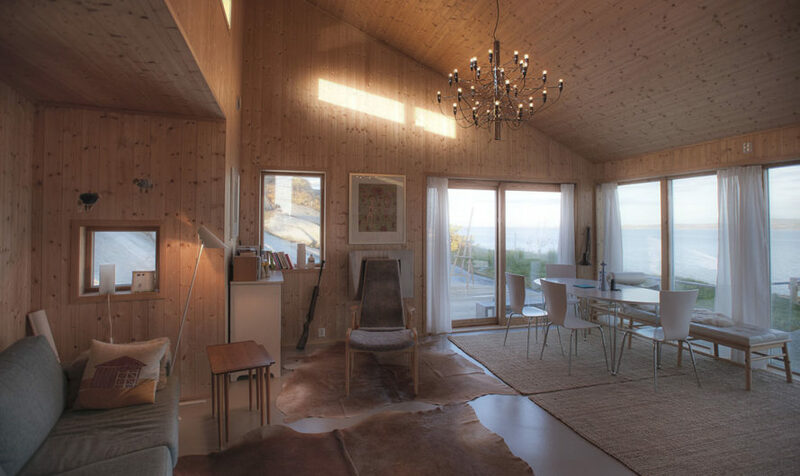 This beautiful spruce-clad cottage in Norway was almost completely built by the owners themselves using materials harvested from their own forest. 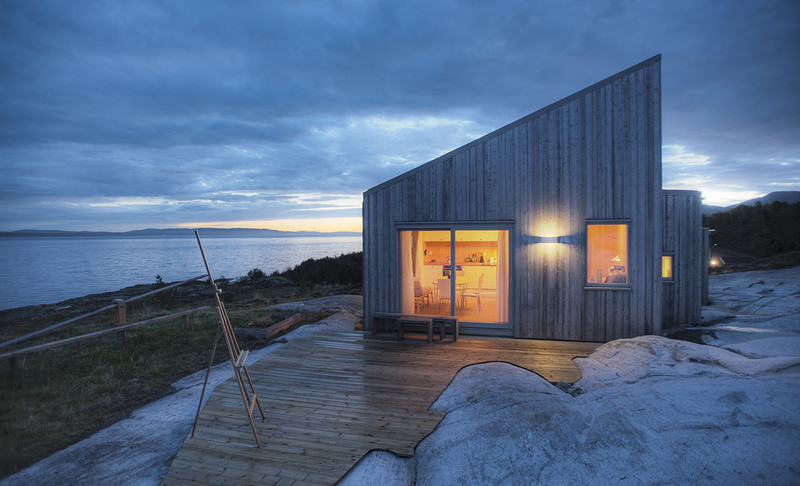 The 645-square foot building, designed by TYIN Tegnestue Architects, maintains the traditional Norwegian closeness to nature and offers stunning views of the surrounding landscape. Sitting on a rocky site surrounded by a marshland, the 645-square-foot cottage looks like a cozy retreat that strips back daily life to its essentials. Its simple exterior is complemented by a warm, welcoming interior. The untreated spruce facade blends into the landscape and develops a beautiful even patina over time. The structure rests on a concrete base and features three different levels that make the building appear lower and emphasize the connection between the interior and exterior. The main entry, sheltered from the elements by a shared gallery, is located next to the outhouse. Special attention was given to details, thanks to an unusually strong commitment of the clients who did most of the construction work themselves. This beautiful spruce-clad cottage in Norway was almost completely built by the owners themselves using materials harvested from their own forest. The building, designed by TYIN Tegnestue Architects, maintains the traditional Norwegian closeness to nature and offers stunning views of the surrounding landscape. Sitting on a rocky site surrounded by marshland, the 645-square-foot cottage looks like a cozy retreat that strips back daily life to its essentials. Its simple exterior is complemented by a warm, welcoming interior. 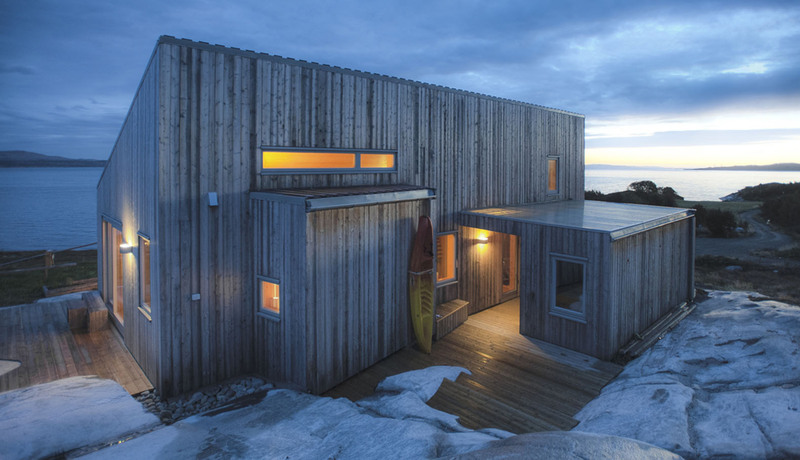 The untreated spruce facade blends into the landscape and gets a beautiful patina over time. The structure rests on a concrete base and features three different levels that make the building appear lower and emphasize the connection between the interior and exterior. The main entry, sheltered from the elements by a shared gallery, is located next to the outhouse. Special attention was given to details, thanks to an unusually strong commitment of the clients who did most of the construction work themselves.